Incremental computation concerns the re-computation of output after a change in the input, whereas algorithms and programs usually derive their output directly from their input. 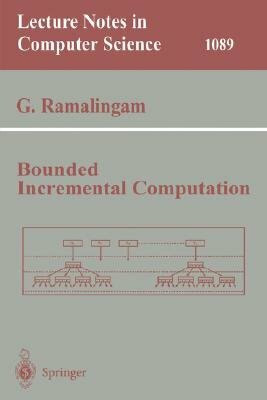 This book investigates the concept of incremental computation and dynamic algorithms in general and provides a variety of new results, especially for computational problems from graph theory: the author presents e.g. efficient incremental algorithms for several shortest-path problems as well as incremental algorithms for the circuit value annotation problem and for various computations in reducible flow graphs.